Weather delays... we've all had them. Mechanical failures... sure, I've had plenty. Air traffic delays... quite common. But, one of the things I never expected to hear was that nearly every airport on a continent is shut down completely due to volcanic ash. What! As we all know, that's exactly what happened this month. Our neighbors to the North in Iceland paralyzed all of Europe by setting off their volcano, Eyjafjallajokull. Say that 5 times fast... um, or even once for that matter. Sneaky buggers. 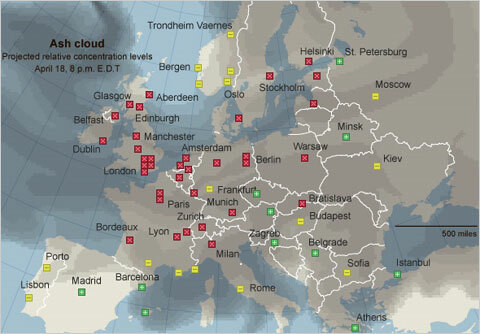 The volcano poured ash into the sky, and the winds blew the ash cloud Southeast over the UK, Scandinavia, and Europe. Since it is very dangerous for planes to fly through ash, because the heat of the jet engines will turn the ash into glass. When the engines become coated in this glass, they shut down. Because this was such an unprecedented event, every country panicked, and immediately shut down all flights. In hindsight, some say that they over-reacted, but that is easy to say when we saw no catastrophic plane crashes due to flying in unsafe airspace. The resulting mayhem was a traveler's nightmare. 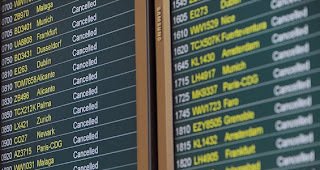 Hundreds of thousands of passengers suddenly became stranded at their current location. Trains, ferries, buses, car rentals all maxed out. Many people had no option but to camp out in the airport for days, and even up to over a week in some cases. After the recent financial crisis to hit the Icelandic Banks that affected many Europeans' savings & investments, many people posted signs that joked, "Hey Iceland: we said we want CASH, not ASH!" As luck would have it, Chad was in the US at this time, attending a conference in Miami. This is the first time he had traveled to the US without me, and then this happens. Figures, huh? Luckily for him, he had flown to NC to visit Cooper & Krista before returning home. So, he was at least able to stay with them during his delay. 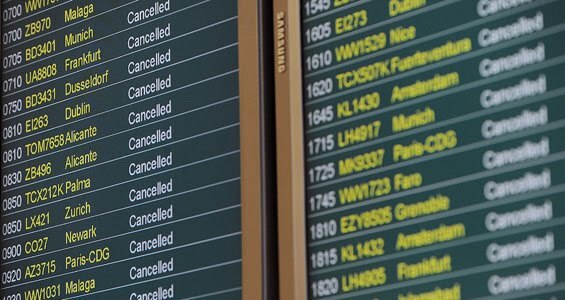 Chad's flight on Sunday was inevitably cancelled. And so began the frustrating process over the next few days of trying to reschedule on another flight. There was such a huge bac klog, though, because everyone in the days before him had also had their flights cancelled, and had rescheduled. So the first available flight was the following Saturday. Then for the next few days, we anxiously watched the news reports of the ash continuing to pour out of the volcano, and the desperate situation that some travelers were in. Looking for all possible options, we looked into flying him into Spain, then traveling to Holland by train, which would have taken days. I even went as far as to look into booking him a ticket on the Queen Mary 2, which still sails from New York to South Hampton, UK. In the end, some of the airspace opened up, and he was able to get on a flight that left Friday, arriving Saturday. This was only a delay of 6 days. So, we both feel very fortunate that it turned out as well as it could have for him. At least he was with friends, and wasn't stranded in an airport, train station or hotel. This whole situation did make me think, though. When living overseas, you just never know what might happen that could prevent you from going home. Who would have ever suspected a freakin' Volcano! At least when you live in the same country, you can drive home if needed. It may take a couple days... but it's an option.